Laserbeak is part of a team of Decepticon spies led by Soundwave. Laserbeak is a tracker who excels at hunting down enemy targets. He�s also a fearsome interrogator who persuades captured Autobots to spill their secrets by threatening them with his laser cannons. Laserbeak is one of Soundwave�s minions and has been around since the beginning of the Generation 1 cartoon series and toyline. He�s got quite a long history which you can read at length elsewhere, so I�ll spare the text. 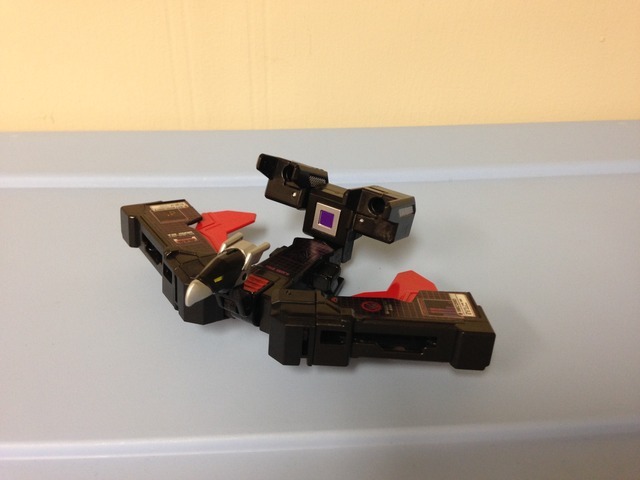 Otherwise, Laserbeak�s had quite a few toy iterations over the years � mostly as tapes, or data discs, etc. designed to work with whichever version of Soundwave is currently released. This version is no different, and is designed as a data pad much like Rumble, Ravage, and Buzzsaw (actually, Laserbeak is a repaint of the latter) with the objective of cross-play functionality with Titans Return Leader Class Soundwave. 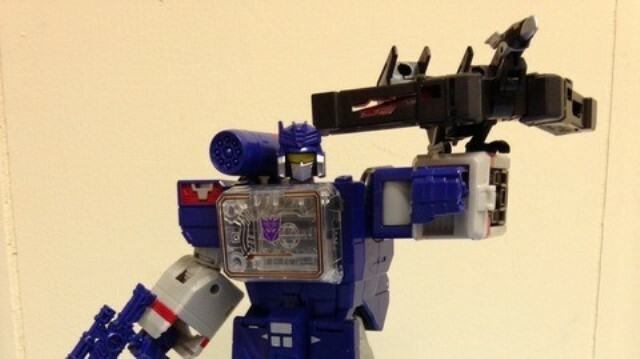 Personally, I think Laserbeak works best when paired with the big blue boom box, but he�s quite sublime on his own. 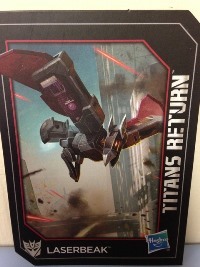 Laserbeak�s premier alternate mode is a data pad that appears to have one of those protective cases on it. The mode doesn�t really do a whole lot on its own, but it�s dressed nicely in black like quite a few real life tablets. It�s also got a square power/wake button on the front bottom, and some nicely done stickers on the front. There�s quite a bit of detail on the �screen� like some spyware and playlist icons, the time, and a couple tracking/recording windows. It�s all done very well, but also a bit on the dark side making it somewhat difficult to see without some good lighting. There�s even a �workable� 3.5 mm port that you can jack a pair of headphones into � a neat touch but largely unnecessary. 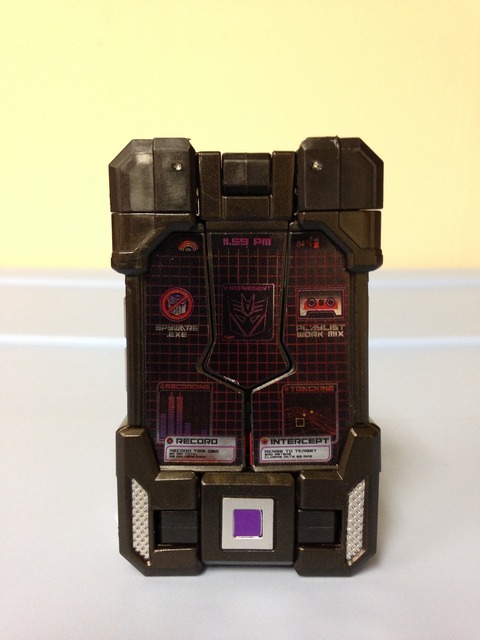 For the most part, the data pad mode does its job, looks the part, and works quite well within TR Soundwave�s chest. Yeah, so usually I would title the mode with whatever appropriate terminology matched the mode. As you can see, this one�s simply labeled �Vehicle� since I can�t figure out what it�s supposed to be. A fork-truck? An assault vehicle? A plow? More or less, Laserbeak�s �third� mode is a data pad on wheels, just in case Laserbeak finds that flying somewhere is simply too fast and he�d rather get to his destination at a pedestrian pace (I�m just guessing this thing moves slowly, it doesn�t appear to be designed by an aerodynamics expert). I suppose the feature here is that there�s a tiny foot peg for a Titan Master to stand on it while it rolls. So, take this mode for what you will; it�s there, but� uh� yeah, it�s just there. Laserbeak�s main �robot� mode is that of a robotic condor. The mode is mostly done in black, with red wings that shift out from the insides of the tablet sides. This is an odd change of pace for Laserbeak, as red is usually mixed evenly with the black � the Takara Legends version of ol� Beaky-face features significantly more red in this mode. There is a tiny bit of red on the base of his neck, and some silver paint apps can be found here and there. The aesthetic isn�t bad, but I think it could have been better with more red thrown in � the black is nice but it is a bit on the bland side. 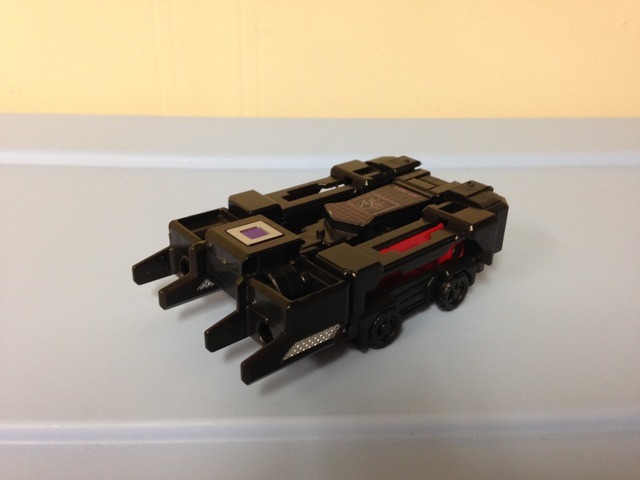 Laserbeak�s head mold looks good and cleanly detailed with yellow eyes. The wings, however, are a bit on the bulky side since they�re made entirely of the tablet sides. The tail is a bit bulky too, being the top of the data pad and also the forks of the *ahem* �vehicle� mode. The condor mode doesn�t do too much, but his head has a bit or range (except sideways movement) and the wings can be moved around a bit. One thing that I think is pretty neat though � on the bottoms of his feet you�ll find a couple silver blocks that are actually the side (volume) buttons for the data pad mode. It�s a neat way to integrate parts into the data pad mode that I didn�t notice until a handful of transformations back and forth. Thumbs up for that! Transformation Design: 6. This isn�t a marvel of engineering, but it is pretty fun to fiddle with even though it�s just folding parts of a block around. The feet becoming the data pad buttons is a slick integration. Durability: 9. Laserbeak is really solid in every aspect, and tiny and light enough that big drops wouldn�t hurt him. The only thin parts are the inner wings, and they�re hidden well enough to not be affected. Fun: 7. Though Laserbeak doesn�t do a whole lot, he�s pretty fun to fiddle with. The data pad has a head phone �jack� and the vehicle mode can accommodate a Titan Master. It�s kind of a shame that the condor mode doesn�t have some TM pegs on it. Pair this guy with Soundwave, and I think you�re rockin�. Aesthetics: 7. Laserbeak looks pretty good in two out of three modes. As a standalone on a shelf, he�s decent, if a little low profile to the ground. I prefer to have him perched somewhere (like Soundwave�s arm), waiting to swoop in. Articulation: 5. This is really an average score here, mostly because he doesn�t have a bunch of joints. Laserbeak would have benefitted from sideways movement on the neck, and the wings would be a bit better with more range. For the most part, he gets the job done for what he is. Value/Price: 7. He�s not a wallet-breaker, and if used as a Soundwave add-on, he�s great. Otherwise he�s just above average since he�s still pretty fun, if limited. Overall: 7.5. Laserbeak is a pretty solid toy all around. He�s fun to fiddle with, easy to transform, and is spot on for a Soundwave add-on. As one of the data pads, I don�t think he�s quite on par with Rumble in terms of standalone features, but he�s far superior to Ravage. If you would like a robot condor to perch around your house for surveillance, Laserbeak is your bird!